Although not novel and about family names (surnames, from an English perspective), this is nevertheless an interesting article about the origins of some common Chinese names. “What is your name?” ought to be a straight­forward question but, for many Chinese, it is often accom­panied by self-conscious explanations, repeated corrections and, finally, resigned capitulation (“Just call me John!”). 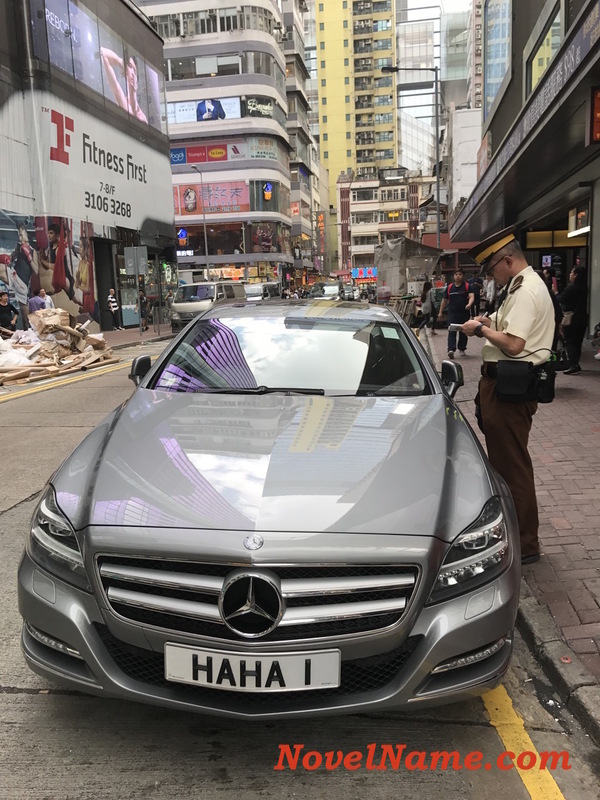 Even in Hong Kong, where Han Chinese form the over­whelming majority, many non-Chinese residents find Chinese names “difficult” – although, in fairness, the fault is not entirely theirs. The modern naming convention is actually quite simple: the family name is placed in front of the given name. For example, the name of the chief executive of Hong Kong, “Leung Chun-ying”, written as “梁振英” in Chinese, is standard, with the family name “Leung” (梁) placed in front of the given name, “Chun-ying” (振英). All would be well if all romanised Chinese names followed this format, but that is not the case. Romanised family names are placed in all manner of positions. They may be rendered in the form of a Western “last name” because the person has taken on or been given a non-Chinese, usually Western, name in addition to his Chinese one, e.g. 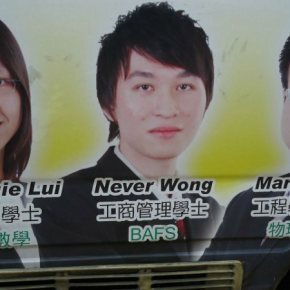 Peter Wong; or he may choose to go by his initials, which usually involves placing his surname last, e.g. C.Y. Leung. In the case of the hybridised Western-Chinese name John Tsang Chun-wah, the surname is the second word (“Tsang”). Vicki Zhao, actress and singer. It becomes even more confusing in the case of married women taking on their husband’s family name in addition to their own, e.g. Carrie Lam Cheng Yuet-ngor, where “Lam” is her husband’s surname and “Cheng” is her maiden name. The practice of capitalising all the letters of the surname, e.g. John TSANG Chun-wah, has not really caught on outside legal and government circles, perhaps because it looks ugly in print. While one’s family name can be placed in front, at the back or somewhere in between in romanised form, in Chinese it always precedes the given name. Hence, while the chief executive can either be “Leung Chun-ying” or “C.Y. Leung” in English-language press reports, in Chinese he will always be “梁振英”, never “振英梁”. As in most patrilineal societies, the Chinese family name is passed down from father to child. A son will pass the same name to his children but a daughter will not: her children will take her husband’s family name. The late Momofuku Ando, born Wu Baifu, Taiwanese-Japanese inventor of instant noodles. The very first Chinese family names, however, might have originated in a matrilineal society. Many of these earliest clan names, known as xing, contain the ideograph for “woman” (女), such as Ji (姬), Ying (嬴), Yao (姚), Jiang ( 姜 ) and so on, which are probably representative of an era between 5,000 and 6,000 years ago, when people knew who their mother was but would have been less sure of their father’s identity. The word xing (姓) is made up of two ideographs that read “born of a woman”, and a person’s xing name placed them within a kinship group that forbade marriage between its members. The appearance of another kinship indicator, the shi (氏), was first recorded in the Zhou dynasty (1046–256BC), by which time Chinese society had become firmly patrilineal and social organisation much more complex. The shi name was essentially a subset of the xing name, and individuals might have taken one because they desired greater differentiation among themselves. For example, imagine a noble family with Ji as their xing name and who had been conferred a few castles and the surrounding lands by their king. Their domain was, say, the state of Zheng. In time, the descendants of this noble family would have taken on the name “Zheng” as their shi name to differentiate themselves from other Ji families, elsewhere. So, a member from this family with the given name, say, Boya, would have been identified thus: “Boya, with the xing Ji and the shi Zheng”, followed by a string of aliases such as style names, courtesy names and the like. Over generations, the descendants of this Boya might have dropped or even forgotten their xing name (Ji) and begun using their shi name (Zheng) exclusively. Some descendants might also have changed their shi names to reflect new circumstances, such as migration or acquisition of a prominent title by one of their own. And then there were commoners without xing names but who took on shi names that identified where they lived, what they did for a living and so on. It was all very confusing! Fortunately, when the first emperor of the Qin dynasty unified China into a centralised empire in 221BC, his administration standardised many aspects of everyday life, including names. The xing and shi names, which by then had become interchangeable in practical terms, were formally merged into the single concept of the family name. By the Western and Eastern Han dynasties (206BC-AD220), which followed the Qin, the naming convention had become stable, with almost every individual sporting a well-established family name followed by a given name, a style that remains the norm. Nevertheless, throughout the imperial period, many people, especially members of the elite, took on or were referred to by aliases in addition to their name, but this practice was dropped in the early 20th century. Today, there are more than 4,700 Chinese family names in use – not including variants – and, according to a 2007 census by the Ministry of Public Security, the most common in the mainland is Wang (王), of whom there are a whopping 93 million. The next most common family names are: Li (李), Zhang (張), Liu (劉), Chen (陳), Yang (楊), Huang (黃), Zhao (趙), Zhou (周) and Wu (吳). Even if the Chinese family names in Taiwan, Hong Kong, Macau and the rest of the world are included, the top 10 surnames remain unchanged. About 40 per cent of the world’s Chinese answer to one of these names. FAMILY NAMES, AND the kinship ties they embody, have a special place in the Chinese psyche. In many immigrant Chinese communities there exist mutual-help associations whose main membership criterion is the possession of a speci­fic family name, regardless of where one’s home province or village was in China. Although less so these days, people with the same family name articulate a connection with each other by saying their ancestors belonged to “the same family 500 years ago”. Indeed, centuries of meti­culous record-keeping has enabled people to trace their forebears back many generations, and the study of these genealogies and other historical texts by scholars has given us the origins and histories of most Chinese family names. The origins can be classified under several categories, the biggest of which is geographical location. Family names in this category came about when a group of people adopted the name of their place of settlement as their kinship indi­cator. The next two categories involve eminent forefathers: these names were either extracted from ancestors’ names and posthumous titles, or indicate their rank and official position. There are also family names that denote the occupations of craftsmen and artisans. In some cases, rulers conferred their own, royal surnames on their subjects and non-Han peoples as a favour or reward. The above categories encompass the majority of Chinese family names, but they are by no means exhaustive or mutually exclusive. Given the sheer size and population of the Chinese nation over several millennia, the same family name might have originated with different people at different places and times, as demonstrated in the stories that follow. The brief accounts are abridged versions of the complex origins of the most common names, and many of the stories are just that. Written in historical texts but not independently verifiable, some of the alleged ancestors might not have even existed. Read them as one would legends or conjectures. The default romanisation for the names follows the Hanyu Pinyin system, and the most common Cantonese romanised forms found in Hong Kong are also given. Note that ethnic Chinese outside the Greater China region, such as those in Singapore, Malaysia and North America, have their own romanised names. For example, Huang (黃) can be Wong, Ng, Ung, Wee, Ooi, Oei, Hwang, Hoang and so on. Origins: Wang means “king” and royal connections are very much in evidence in the stories of the surname’s origins. Prince Jin, the oldest son of King Ling of the Zhou dynasty (died 545BC), was demoted to a commoner for being critical when advising his father. Given their royal antecedents, the former prince’s descendants were referred to as “the king’s family” (wang jia) and “Wang” became their shi name. Other descendants of the royal family of the 800-year-long Zhou dynasty took on the kingly Wang as their family names at various times. Also, due to intermarriage, or the desire to assimilate or form alliances with the Chinese empire, non-Han peoples, such as the Xiongnu, Koreans, Khitans, Mongols and Manchus, gave themselves the surname Wang at various times in history. Famous Wangs: Wang Yi (王毅), foreign minister of China; Wong Kar-wai (王家衛), film director; Wang Leehom (王力宏), Taiwanese-American singer. Origins: during the reign of the legendary King Yao, the minister of justice (da li, “大理”) was an individual called Gao Yao. His descendants inherited the position and took Li (理) as their shi name. During the late Shang dynasty, one of Gao’s descendants, Li Zheng, angered the king, who had him executed. During their flight from the capital, Li’s wife and their infant son ate the fruit of a plum tree when they had run out of food. When they were finally safe from danger, Li’s wife changed her son’s name from “理” to the identical sounding “李” (“plum”) in gratitude for the life-giving sustenance of the plum tree, but, more importantly, to hide him from the king’s wrath. This was how the family name Li came into being. One of the reasons Li became such a common name was because, during the Tang dynasty (618-907), emperors had the propensity to confer the imperial surname Li on many of their subjects as reward for services rendered to the throne. This largesse extended to foreigners such as Arabs, Persians, Jews and Koreans who settled in China. Famous Lis: the late Lee Kuan Yew (李光耀), first prime minister of Singapore; Li Ka-shing (李嘉誠), property magnate; the late Bruce Lee (李小龍), international film star. Origins: this name can be traced all the way back to the Yellow Emperor, the mythical founder of the Chinese nation. Inspired by his observations of the stars in the night sky, Hui, a grandson of the Yellow Emperor, invented the bow, which greatly facilitated hunting. His grandfather put him in charge of manufacturing bows and arrows, and gave him the title bow master (gong zhang, 弓長). Hui’s descendants combined the two characters of the title to form their shi name, Zhang (張). Another major branch of the Zhang family name originated much later, during the Zhou dynasty. The descendants of Xie Zhang (解張), a senior official in the state of Jin, took the second character of their ancestor’s name and made it their family name. Famous Zhangs: Zhang Dejiang (張德江), chairman of the Standing Committee of the National People’s Congress and top official responsible for Hong Kong and Macau affairs; Zhang Yimou (張藝謀), film director; the late Leslie Cheung Kwok-wing (張國榮), Canto-pop star. Origins: here be dragons. During the latter years of the Xia dynasty (circa 2070BC-1600BC), Liulei (劉累), a descendant of the legendary King Yao, was the official in charge of the king’s dragons. When one of them died under his care, Liulei fled with his family and settled in present-day Henan. His descendants adopted the shi name Liu, from the first character of Liulei’s name. It remains uncertain if these “dragons” were Yangtze alligators, giant lizards or snakes. Another story regarding the family name is more prosaic. In 592BC, King Ding of the Zhou dynasty conferred the state of Liu on his younger brother, and its residents took Liu as their family name. Much later, during the Western and Eastern Han dynasties (206BC-AD220), the Chinese empire kept peace with the nomadic peoples at its northern and western borders with alliances secured by marriage. Chinese princesses were given in marriage to the rulers of the nomads, many of whom adopted the surname Liu, the family name of their royal in-laws. Many Lius today are the descendants of these intermarriages. Famous Lius: The late Liu Shaoqi (劉少奇), one of the top political leaders of China in the 1950s and 60s; Andy Lau Tak-wah (劉德華), Canto-pop singer and actor; Joseph Lau Luen-hung (劉鑾雄), fugitive tycoon. Origins: when the Western Zhou dynasty was established, in 1046BC, the founding King Wu managed to locate a descendant of the legendary Emperor Shun, who had ruled the Chinese nation some 1,000 years before. This individual, named Man, who might or might not have been the descendant of a king who might or might not have actually existed, was made the ruler of the state of Chen, which covered present-day eastern Henan and parts of Anhui. To cement the legitimacy of his new dynasty, King Wu married his oldest daughter to Man, who was tasked with making regular offerings to his virtuous ancestor, King Shun. Man became Chen Man after adopting the name of his state as his shi name. After his death, Chen Man was conferred the title Duke Hu (胡公). Chen Man is acknowledged as the progenitor of not one but two family names: Chen (陳), after the name of his state, and Hu (胡), from his posthumous title. Famous Chens: Chen Shui-bian (陳水扁), former president of Taiwan; Joseph Zen Ze-kiun (陳日君), cardinal and bishop emeritus of Hong Kong; Jackie Chan (陳港生, known professionally in Chinese as 成龍), Academy Award-winning actor. Origins: King Kang, the third king of the Western Zhou dynasty, who reigned from 1020BC to 996BC, made a cousin, Zhu, the marquess of a small region called Yang, located in present-day southwestern Shanxi. In 514BC, the state of Yang, which had changed hands a couple of times, was conquered by the powerful state of Jin. The descendants of its rulers and its residents adopted the name of their vanquished state as their shi name. Famous Yangs: Chen-Ning Franklin Yang (楊振寧), co-winner of the 1957 Nobel Prize in Physics; Michelle Yeoh Choo Kheng (楊紫瓊), Malaysia-born international film star; Jerry Yang (楊致遠), Taiwanese-American co-founder of Yahoo! Origins:the name can be traced back to the state of Huang, which was founded during the Shang dynasty. The tiny state, located in present-day Henan, acknowledged the legitimacy of the Western Zhou dynasty when the latter replaced the Shang dynasty in 1046BC. As a reward, the Zhou king conferred the ruler of Huang with the minor rank of viscount. Huang was one of the two tiny states that fought against the rise of their giant neighbour, the state of Chu. Its resistance came to nought when it was unceremoniously annexed by Chu in 648BC. In remembrance of their former home, Huang’s residents took its name as their shi name. Famous Huangs: the late Anna May Wong Liu Tsong ( 黃柳 霜 ), the first Chinese-American Hollywood movie star; the late Ng Teng Fong (黃廷芳), Singapore and Hong Kong property magnate; Joshua Wong Chi-fung (黃之峰), secretary general of Hong Kong political party Demosisto. Origins: the progenitor of the Zhaos was an individual called Zaofu, who was famed for his skills in training horses and steering chariots. He was the personal charioteer of King Mu, of the Western Zhou dynasty, who reigned from 976BC to 922BC, and often accompanied the merry monarch on his hunting expeditions and travels. It is said that once, they went so far west they reached the Kunlun Mountains, where they met the Queen Mother of the West, whom historians have posited was a female ruler of a tribe or state rather than the Taoist deity of the same name. For his services to the king, Zaofu was given the domain Zhaocheng (趙城), after which he adopted Zhao as his shi name. Zaofu’s seventh-generation descendant went into the service of the state of Jin and, in time, the Zhao family divided Jin with two other families and founded the state of Zhao, whose territory occupied parts of present-day Hebei, Shanxi and Shaanxi. Famous Zhaos: the late Zhao Ziyang (趙紫陽), former premier of China; Cecil Chao Sze-tsung (趙世曾), business magnate; Vicki Zhao Wei (趙薇), actress and singer. Origins: although the Zhou dynasty lasted almost 800 years, its rulers were kings in name only for most of the dynasty’s existence. The royal domain was surrounded by powerful states, which were nominally subordinate to the king, and by the time the state of Qin put the dynasty out of its misery, in 256BC, the hapless Zhou king was the lord of only a tiny parcel of land in central China. As with many family names, members of the former Zhou royalty and the citizens of Zhou took the place name as their shi name. Famous Zhous: the late Zhou Shuren (周樹人), 20th-century literary giant who wrote under the pen name Lu Xun; the late Zhou Enlai (周恩來), premier of China; Jay Chou Chieh-lun (周杰倫), Taiwanese entertainer. Origins: two generations before the establishment of the Zhou dynasty, in 1045BC, the founding king’s grandfather, the leader of the Zhou tribe, wanted to make his third son (the king’s father) his heir. The first and second sons, knowing their father’s intentions, made themselves scarce by leaving the tribe with their families and heading south. It would have been a very long trek from the home base of the Zhou tribe, located in present-day Shaanxi, to the lower reaches of the Yangtze River, and considering that the latter was then an undeveloped region peopled by barely civilised barbarians, it would suggest the exile was not entirely voluntary. When they reached their destination, the older brother became chief of the locals and when he died, the younger took over. Both brothers “went native” by tattooing themselves and cutting their hair. By the time the Zhou dynasty was founded, the Zhou king formally created the state of Wu, south of the Yangtze, and made his uncle’s descendant the ruler. The people of Wu began to take Wu as their shi name. Famous Wus: John Woo Yu-sen (吳宇森), film director; the late Momofuku Ando, born Wu Baifu (吳百福), Taiwanese-Japanese inventor of instant noodles; Daniel Wu Yin-cho (吳彥祖), Hong Kong-American actor.